The UK government has announced its backing for a feasibility study into extending the Borders Railway. It could see the line from Edinburgh to Tweedbank taken to Hawick and Newcastleton and then on to Carlisle. Scottish Secretary David Mundell confirmed his government's support - as part of the Borderlands growth deal - in a letter to MP John Lamont. 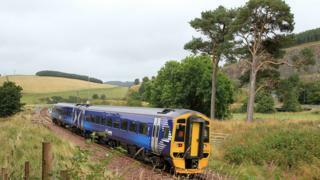 Mr Lamont said it was "great news" for the campaign to take the line to Hawick and beyond. "We need to improve transport links across the whole of the Borders and extending the Borders Railway is part of this," said the Berwickshire, Roxburgh and Selkirk MP. "A full feasibility study will look in detail at the costs and benefits of bringing the railway to Hawick, Newcastleton and on to Carlisle. "I'd expect this to look at things like impact on businesses, jobs and tourism as well as the implications of getting freight off our roads." Barbara Elborn, Newcastleton and district community council secretary, described it as a "huge leap forward" for the campaign to extend the line. "There is absolutely no doubt that the benefits of reinstating the line will be felt by all within in the Borderlands growth deal catchment, but a feasibility study that delves deep to understand the full opportunities, and in our view that must include freight, will fully answer all those who doubt it," she said. "Those communities who have lived through the last 50 years without the line have no doubts at all about the rewards it will bring." Transport Scotland said it understood the importance of connectivity in the area and had already completed its Borders Transport Corridor Study. "This identified the option of extending the Borders Railway to Carlisle as one of 21 potential transport interventions for further consideration through our strategic transport projects review," a statement added. "We welcome the opportunity to discuss potential joint funding for a detailed consideration of cross-border transport links that would align with the outcomes of the second strategic transport projects review, once it is completed."